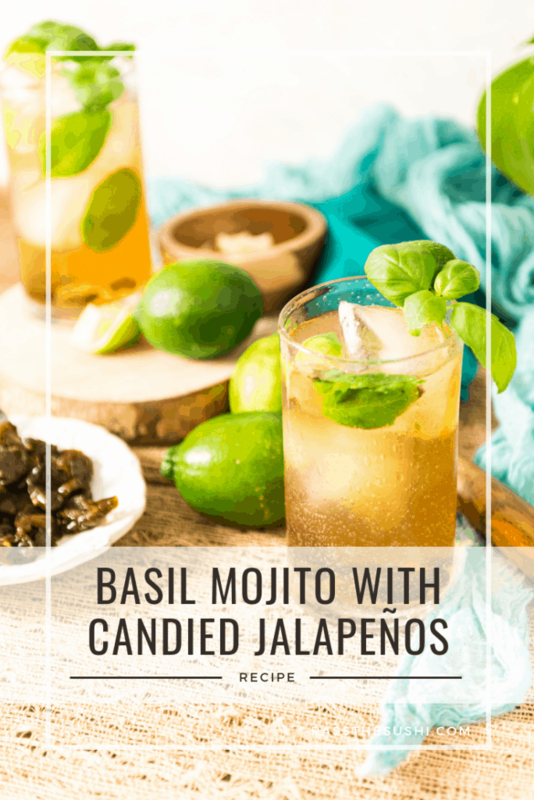 Whether you’re looking to spice things up or just looking for a new twist on a classic cocktail, this Basil Mojito with Candied Jalapenos is a fun and easy recipe. Grab your shades and let’s imagine for a moment we are walking through the streets of Havana. There’s the bustle of people working, kids playing soccer barefoot and giggling on the corner square, laundry is hanging from windows above shops to dry. There’s a flower cart and fruit cart rolling down the street for purchase and a few cars, hoods popped, awaiting repairs, lined up in a rainbow of classic pastels along the curb. There’s a corner bar, with records piled high and a box fan moving air through the tight space inviting you in for a signature cocktail…. My memories of Havana are wrapped in a cloak of inspiration from classic literature and island culture and the realism the crumbling old streets expose. It’s stunning and captivating. Just like my tourguides. And in addition to having beautiful smiles to greet you with, the Cubans make a damn fine cocktail for a thirsty traveler. If you are dreaming of celebrating the hot nights with a perfect Cuban libation, look no further than the mojito. 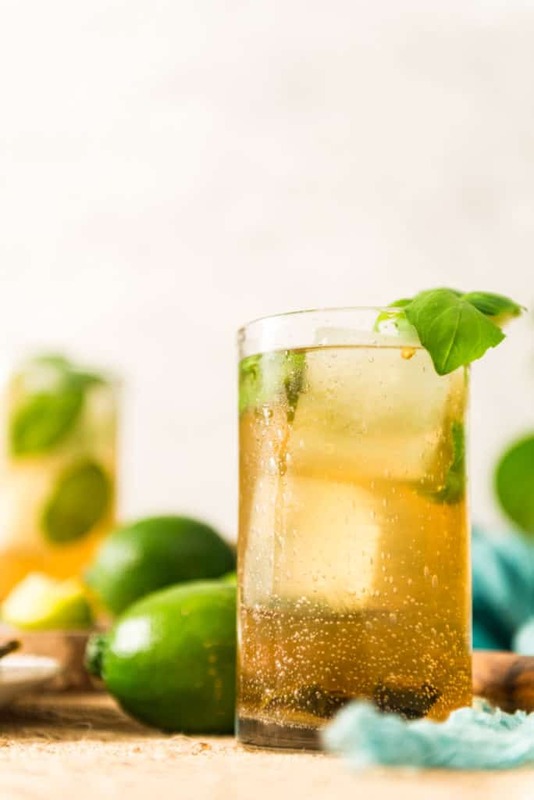 A classic Mojito is an uncomplicated cocktail with only 5 ingredients. It’s a perfect crisp and refreshing cocktail, especially if you happen to be sitting beachside on a sunny day. Created in Cuba, the drink has roots back as far as the 16th century. It is said that somewhere between a failed invasion of Cuba and the sugarcane drink of the slave workers in the fields may have inspired the ingredients in the early stages of the cocktails birth and the rise of the rum industry in the 1800s brings it to its full glory. Jump to modern day, rooftop sitting in Cuba is still the perfect place to enjoy a mojito in the humid air as the sun fades cotton candy pink. There’s nothing quite like it. At home, when I am feeling a little Hemmingway and wanting to make things sweet and spicy, going through my memories of traveling through Cuba, I create my own classic Cuba cocktails. One of the key ingredients to a mojito is sugar. Using a simple syrup to sweeten cocktails is an age-old trick and a simple recipe to create and store at home for your own uses. Simple syrups are a 1:1 ratio of sugar to water. Simply heating the mix over low heat and dissolving the sugar is all it takes. You can dilute the ratio if desired, and I often do to a 2:1 water to sugar syrup if you are looking to cut the sweet a bit. From there, you can infuse a variety of flavors. From herbs of any sort to vanilla bean pods or even candies, simple syrups concentrate the additional flavors and make them perfect for adding to cocktails or other sweets needing a bit of a bonus. I love a balanced cocktail that doesn’t feel like fruit juice, but hits multiple flavor notes, sour, sweet and even the burn from a little spice. With that in mind, I immediately thought of canned jalapenos. And a crisp infusion. 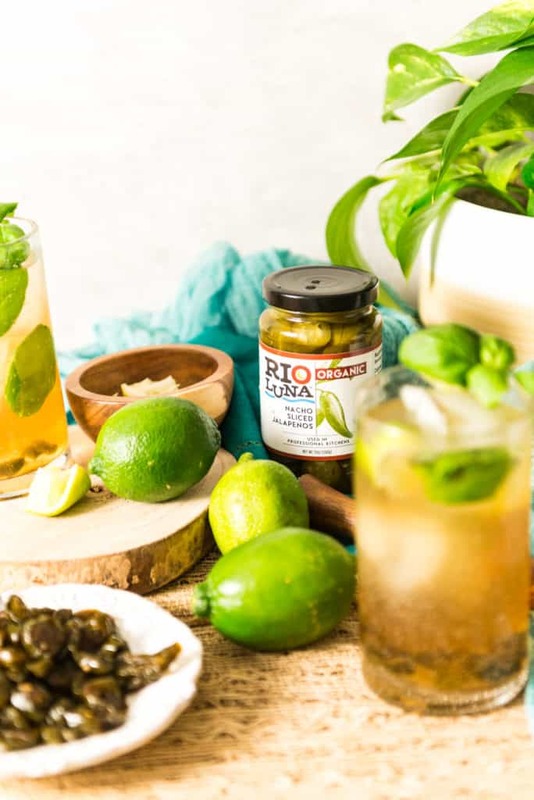 To create this one, I used white coconut rum from the islands, infused the heat from the jalapenos into a simple syrup and added a pop of freshness with crisp basil leaves. Grab this coupon and give Rio Luna Organic Peppers at Krogers and Whole Foods. 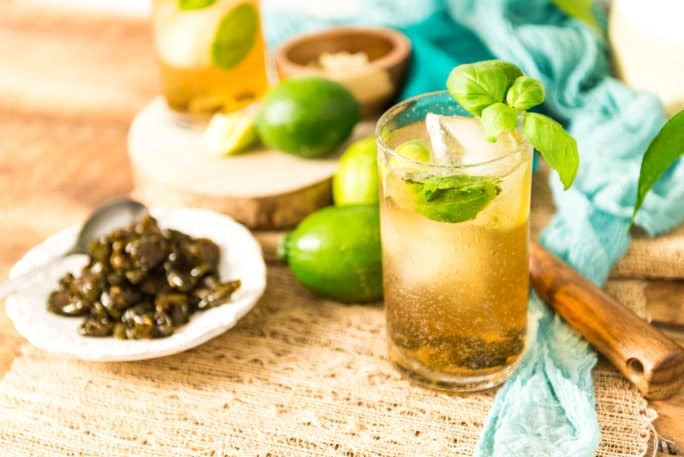 If you’ve tried this Basil Mojito with Candied Jalapenos Cocktail Recipe or any other recipe on passthesushi.com please don’t forget to rate the recipe and let me know where you found it in the comments below, I love hearing from you! You can also follow along for more good eats and travel tips on Instagram @passthesushi & @girlcarnivore, Twitter & Facebook. This is a spicy twist on a classic Cuban cocktail. 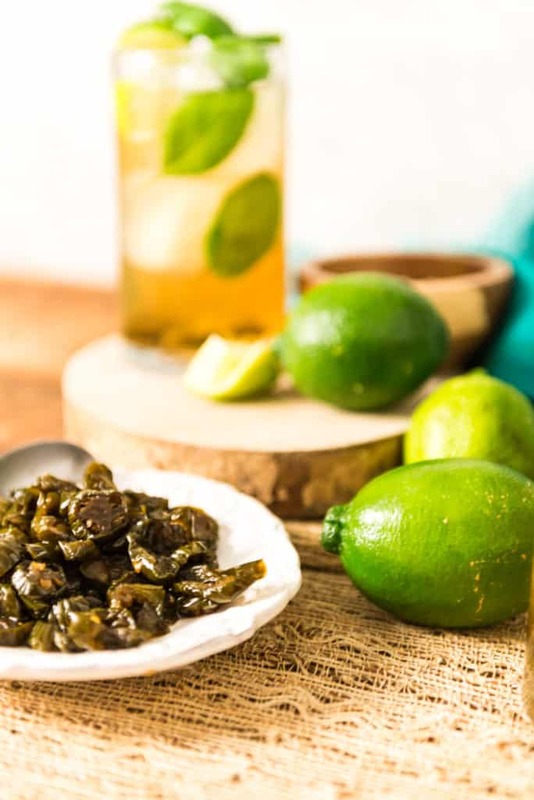 The candied jalapenos allow you to add as much or as little heat as you can handle and the basil brings an earthy freshness to each sip. Mix the brown sugar and water in a heavy pan over low heat. Allow to cool 30 minutes. Strain the jalapeno slices from their liquid. Let sit in a strainer for 15 minutes, shaking every now and then to remove any drained liquid. Toss the jalapenos in a bowl with just enough simple syrup to coat, 3 to 4 tablespoons. Arrange on a single layer on a baking sheet. Bake in the oven for 2 hours, or until crisp, flipping once. Place back in the original jar with enough simple syrup to cover. 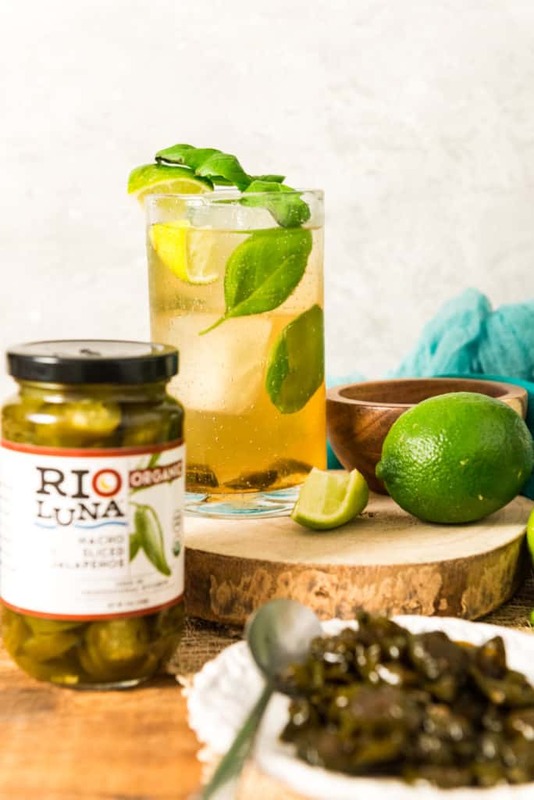 In 2 glasses, muddle a few basil leaves and slices of simple syrup infused jalapenos in the bottom of a tall highball glass. Add the rum, jalapeno-infused simple syrup and lime juice. Garnish with more jalapeno slices, sprigs of basil and a lime wedge. These are 'quick' candied jalapenos, not classic canned ones. They are great for a week stored in the fridge. To make a Mocktail Basil Mojito with Candied Jalapenos, omit the rum. Add the simple syrup and soda with fresh basil and jalapeno slices over ice and stir to combine.